"Without the hearing, there is no fearing." Such is the case in most churches today. Lazy hireling shepherds who only fear loosing membership, no longer preach a literal hell. 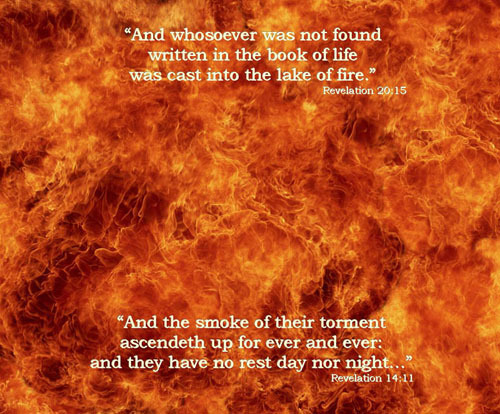 In the chapter titled Forsaken – Wrath of God, R. B. Jones writes, "The Bible is careful to call attention to the wrath of God. We read of His "‘hot anger’ (Judges 2:14), His ‘hot displeasure’ (Deuteronomy 9:19), and His ‘fiery indignation’ (Hebrews 10:27). The wrath of God is revealed, coming, poured out, abiding, filled up in its awful fullness upon he ungodly. ...In hell, His wrath abides on those who have refused the gospel. "But of all the revelations, we see His wrath in clearest demonstration at the cross. There the Father forsook His Son because on the cross, Jesus was assuming responsibility for all the worlds sin-guilt. God's attitude toward sin forced Him to turn His back on the dearest of all to Him when that son insisted upon going to the place of condemnation for the sinner. "In the distant eternity the Son of God had elected to represent lost men and deal personally with their condemnation. He knew that He would have to suffer alone. The book of Revelation pictures Christ as ‘the Lamb slain from the foundation of the world’ (Revelation 13:8). May it not be that the prospect of this hour of God-forsakenness is the explanation of the vicarious agony that never forsook Him from the moment He set out upon the path of redemption until this lonely cry broke from His lips? "God's smoldering wrath, so long as it delays its manifestation, strangely enough contains glorious elements of sympathy. "...We have at the cross a prophetic demonstration of Judgment Day when no consideration is given, no sympathy offered, to Him who bears sin upon His vicarious shoulders. "Do we see that feature of God's wrath? Do we understand that all unbelievers must appear before an angry God who will refuse every suggestion of mercy? How different it will be from the manifestation of the God of the gospel! Now, He pleads with the sinner to accept His mercy; now, He urges us to appropriate His favors; now, He pursues us with His kindness. It will not be so in the Day of His Wrath... Perfect justice will be stern... No mercy was granted to Him in response to His cry. Nor will it be otherwise with him who goes down to judgment unprepared by repentance and faith. For those who reject God's free gift of Salvation through Christ.